TOURING WINE COUNTRY STARTS HERE! Great Park! Enjoyed our stay. Activities for all ages. Clean and well maintained sites, laundry room pool and restrooms! Friendly and helpful staff! We will be back! Thank you! Thank you for taking the time to review our park. We hope to see you again soon and we will continue to strive to make your visit as enjoyable as possible. We have stayed here several times because of its location (lots of wineries nearby). The resort has pull-thru concrete pads and grass. The pool and hot tub are great. The facility is very well maintained. It is right off the freeway, so there is some noise from that. We will stay again. Thank you for taking time to review our park. We hope to see you again here in Prosser. We make it a point to have a clean and neat facility plus we are always trying to improve or update things. Very nice park but has way to many drunks and parties that are loud to all hours of the night park has a 10pm cut off but doesn't in force it. Well never stay at this park again. Thank you for reviewing our park. We try hard to enforce the rules as much as possible. Sometimes we do not hear of issues until after the fact. We hope you find it in you to give us another try one of these days when you find yourself on the road. The park was even nicer than we expected. The office/store/wine area is beautifully set up with a good inventory. The roads and sites are well maintained and level with nice landscaping touches. The staff were super nice and made sure we knew all about the area - we were glad they told us about Chukar Cherry factory store! They have an excellent knowledge of the wineries and have on-site wine tastings with different vineyards. They are right in Prosser so it's easy to access the local area. We didn't use the pool but it looked good. Very nice park with great people. Thank you so much for your review. We strive to keep the park neat and clean for our guests so the experience is worth returning for. We work very close with local wineries and businesses so that we can give you as much information about Prosser as we can. We hope to see you again soon. This is one of our favorite RV resorts. The staff is amazing, the sites are beautiful and well maintained all year round, bathrooms are amazing, and it's actually a 10-10-10 park. 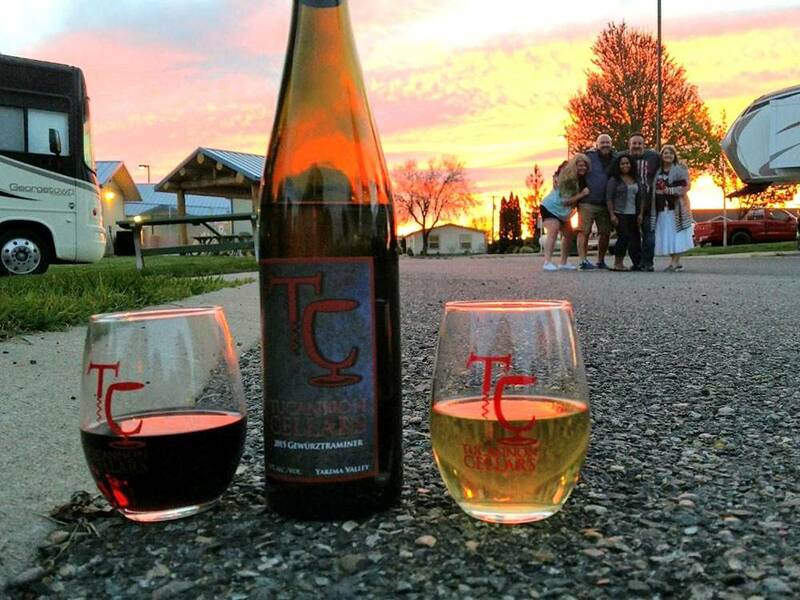 The location is within walking distance of several tasting rooms, and almost every weekend they offer wine tasting in the park. Who does that? We stayed here the first time by chance, but now include it in every trip we do this way. Often, we plan a weekend just to come here. Always a great place to stay. Thank you for taking the time to review our park. We are to be one of the few 10*10*10 parks in Washington state. We will continue to offer great customer service and a well maintained park. We hope to see you again soon. We have stayed here a few times now, and every time look forward to the next stay. What a great group of staff that will go out of the way to make sure your trip is great. Between the wine tastings that are set up on the evenings, the events that are scheduled, or even the shuttle services they provide when asked, I am not sure you could find a better place to stay when wine tasting. We look forward to our next trip to Prosser! Nice campground, no real shade, great operators and a good location. Nice place to spend a little time. Might be a little hot in the summer. only stayed over night. quickly greeted by a friendly staff. plenty of room in our full hookup site. clean bathroom with individual shower. several wineries within walking distance. would stay there again. Despite being just down the street from a freeway rest stop and directly across the road from a commercial fueling station, the campground was very quiet. Clean spaces, nice grass between the sites and propane on site. The pool was refreshing, although very shallow-under 4'. We didn't hear any freeway noise or commotion from the fueling station during our 3 nights there. We were in space 13, and would definitely stay here again. 12 wineries within walking distance, we took advantage of their tasting rooms during our stay. The BEST park I've experienced in 36 states and 30,000+ miles the past year-and-a-half. (I haven't done them all and YMMV.) The largest and cleanest restrooms/showers one could hope for--deserving of the 10+. Reasonably priced washers with fast dryers! Maintained grass between spaces. Having a dingy we spent 2 weeks sampling local wines; shopping farm markets; visiting nearby towns and a National Park. Much more enjoyable than I anticipated. Happy wife...! 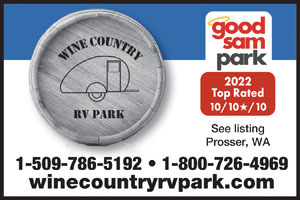 Interested in wine tastings but don't have a dingy or tow to drive around? Don't worry. There is an area within walking distance that has several wine tasting rooms. The park also has on-site wine tastings three nights per week with bottle sales. The manager and staff enjoy their jobs, are energetic, and you are their priority. Believe it! Occasionally, the manager puts out freshly made baked goods. (shhh! don't tell.) If you don't feel like family when you leave, don't blame the host. They really are there for you. This is a fairly new RV park so the trees aren't yet mature. The place is clean, quite neat and well-maintained. There's plenty of space between sites and many pull-throughs. I used the laundry facilities (4 washers and dryers). They were clean and functional. The restroom/laundry area is pleasant. There is a walking trail around the entire park w/ adequate area for dogs. There is not, however, a fenced dog area for off-leash. That would be a welcome addition. Access to the park is excellent. There are many wineries within walking distance. We were here on a Monday and Tuesday so it was fairly quiet. We would definitely stay here again.